ften referred to as one of the most beautiful farms in Chester County, Whitewing Farm is hidden on a country road, quietly nestled in the historic Brandywine Valley adjacent to the world-renowned Longwood Gardens and just minutes away from Winterthur and Brandywine River Museum. 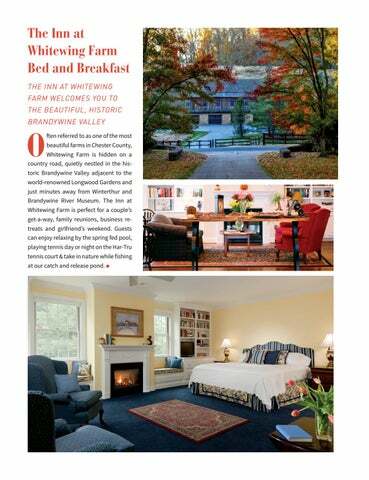 The Inn at Whitewing Farm is perfect for a couple’s get-a-way, family reunions, business retreats and girlfriend’s weekend. Guests can enjoy relaxing by the spring fed pool, playing tennis day or night on the Har-Tru tennis court & take in nature while fishing at our catch and release pond.